Christ's coming, and redeeming mankind. Ver. 1. Psalm. Prot. intimate that this was not in the Heb. ; but we find mizmor, "canticle," which is equivalent. H. --- David speaks of his own restoration to health as a figure of Jesus Christ, who is principally intended, Heb. x. 7. The end of the psalm is nearly the same with the 69th. C. --- Some arbitrarily (Bert.) explain the words with relation to the revolt of Absalom. Bossuet. --- Others think it may refer to the captives, (Ven. Bede) to Daniel, or Jeremias, rescued from prison. See Theodoret, who explains it of men waiting for the general resurrection. It may express the sentiments of the Church, when the persecutions ceased. Euthym. --- Christ sometimes speaks in his own name, and sometimes in that of his members. S. Amb. S. Aug. C. --- It is certain that David had Christ in view; and if he alludes to himself, it is only as the figure of him. Bert. Ver. 2. Expectation, or patience. H. --- God has, at last, granted my request. Ver. 3. Misery. Heb. "confusion," (Bert.) or "noise," (S. Jer. H.) from the greatest danger. Theod. --- Dregs. Mud. Jer. xxxviii. 6. S. Aug. &c. explain this of the Christian saved by faith from the sink of his sins. C.
Ver. 4. New. Excellent. H. --- I was before uttering complaints, now I give thanks with joy, for my health and conversion. C. --- Song. Heb. "Praise." The penitent changes his language, which is no longer understood by worldlings. Bert. --- Many. S. Aug. reads, the just, who take part in the welfare of their brethren, (Ps. xxxi. 11.) while the wicked are filled with alarm, at the ways of God; who humbles or exalts people as he pleases. C.
Ver. 5. Vanities. Heb. "the proud, nor such as turn aside to lies." Prot. H. --- All the world is vanity, (Ps. xxxviii. 6. &c. C.) though idolatry may be here meant. S. Cyr. Ver. 6. Thoughts, or designs, "over us," as Heb. adds. No one can fathom the counsels of the Lord. It is folly, therefore, to attack his mysteries. H. --- Like. Prot. "and thy thoughts which are to usward, they cannot be reckoned up in order unto thee." Lit. non ordinare apud te. Mont. H. --- But haroc means also æquiparare, which corresponds with the Vulg. Bert. --- Syr. "none is comparable to thee." C. --- Number. Christ and his apostles preached, so that many followed their doctrine. W. --- David also had many witnesses of his gratitude. They crowded round him. Some would improperly make multiplicati sunt, agree with mirabilia, dialogismoiV, which is in the masculine. Bert. --- "I find no order before thee; if I would declare and number, they are more (wonders) than can be counted." S. Jer. H. --- I am at a loss how to express myself, and must be content with the interior sentiments of gratitude. See Ps. lxx. 15. C.
Ver. 7. Sacrifice and oblation. Neither bloody nor unbloody sacrifices of the law will do. M. --- Pierced ears. Sept. and S. Paul read, a body thou hast fitted to me. Heb. x. 5. H. --- Nobilius mentions, that he found the reading of the Vulg. in one Gr. MS. in Eus. &c. --- The Arab. has both. "Thou hast prepared a body for me, and opened my ears." C. --- Both are, in effect, of divine authority. The version adopted by S. Paul, cannot be rejected, no more than the Heb. confirmed by the Vulg. James Pierce asserts, that the Heb. is incorrect, oznaim being put for az zip, "then a body," as the letters are not unlike. The dissertation is ingenious: the author is, however, suspected of Socinianism. We know not the reason why the Vulg. here abandons the Sept. The sense is much the same; the prophet noticing the entire obedience of the Messias, (Bert.) and the apostle comprising his whole person. M. --- His body was miraculous, (H.) and the incarnation the work of God. C. --- Nothing could come up to his submission. "Thou has dug ears for me," (S. Jer. H.) alluding to the custom of making slaves for ever, (Ex. xxi. 5.) or "thou hast fitted, (C.) opened, (Prot.) my ears," enabling me to hear, and to obey. H. --- The sacrifice of Christ was never interrupted, from the first moment of his incarnation. C. --- He was always doing the will of his Father. H. --- This sacrifice is the most essential. God rejected all such as were destitute of this condition, or were not offered by people determined to observe the whole law. 1 K. xv. 22. Is. i. 11. Jer. vii. 22. Porphyr. Abs. ii. C. --- No sacrifice of the Old Testament was sufficient to satisfy God's justice for sin. Christ, by the ear of obedience, performed the redemption of man by his death, as was determined from eternity. See Heb. x. W. --- And is omitted in the Latin version of S. Paul, holocautomata pro peccato, inadvertently, or rather to intimate, that he was speaking of the holocaust of expiation. Heb. x. 6. 8. and xiii. 11. and Lev. xvi. 27. Bert. --- S. Aug. also admits only one species of sacrifice, "holocausts likewise for sin." But others distinguish them from the victims designed to expiate the sins of individuals, (Lev. v. &c.) of which the prophet also speaks. C.
Ver. 8. Head, or beginning, (Gen. i. Jo. i. and viii. 25. S. Jer. &c.) or at the commencement of this book of Psalms, (S. Aug.) or rather in the whole Bible. C. --- Kephalis denotes a volume, (Suidas) or stick, on which books were formerly rolled, being written on parchment. 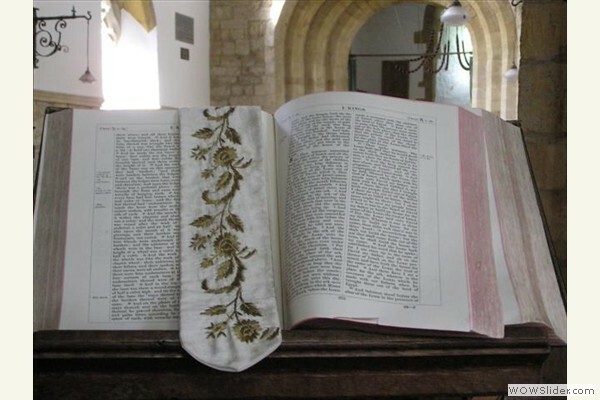 The Jews still observe the same custom in their synagogues. C. Lu. iv. 17. 20. --- Heb. "In the volume of the book," means, in the book, (Amama) or the Bible, which is the book by excellence, where the incarnation and death of Christ, for man's redemption, are clearly specified. H. --- This is the sum of the Scriptures. W. --- They bear witness to Christ. Jo. v. 39. Luke xxiv. 27. H. --- The apostle uses the word capitulum, for the sum. Hebrews viii. Whatever sense be chosen, we should meditate on this head, or volume. But Christ signed, as it were, this solemn engagement, from all eternity. If we adopt the passage to David, we may translate, "I come, having on me the volume of thy Scriptures." See 4 K. xi. 12. C.
Ver. 9. Heart. So the Vat. Sept. reads; while other editions have koiliaV, "belly." S. Jer. ad Sum. --- Heb. "bowels." H. --- The sense is the same. Bert. --- I love the law so much, that I would hide it in my bowels, (C.) or in the most secret place. Theod. Ver. 10. Thy, is not expressed in Heb. or Gr. but understood. Bert. --- Church, in the tabernacle, (Theod.) or rather in the Catholic Church; the propagation of which, (H.) and the preaching of the gospel throughout the world are foretold. W. --- The justice, or mercies of our Saviour, are every where proclaimed. S. Jer. C.
Ver. 11. Thy. Some copies of the Sept. have, my justice, as well as the Ethiopic version. Eus. S. Aug. &c. C. --- But the Vulg. is more correct. Bert. --- Council. Christ conceals not his mercy and truth from the greatest and wisest congregations. He spoke boldly before Annas and Caiphas, as S. Paul did at Athens, &c. W. --- David testifies his gratitude, and invites all to praise God with him. C. --- But we must particularly learn from our Saviour, a horror of sin; the knowledge of his mysteries; confidence in his mercy; and a conviction, that we can never be saved but by his grace. He has announced these things, and then he finishes his career, by suffering for us, and pours forth his supplications to God. Bert. Ver. 12. Withhold not. The prophet now speaks in the name of Christ's mystical body, the Church, praying to be made a partaker of mercy, and to be delivered from evils, (W.) or Christ speaks as the victim for our sins. H. --- Uphold me. This might be also rendered as a prayer, "May thy," &c. with the Heb. and some copies of the Sept. Bert. Ver. 13. My iniquities. That is, the sins of all mankind, which I have taken upon me. Ch. C. --- The sins even of those who believe, are so numerous, that they cannot be seen in particular. We may faint at the sight of so many sins committed by Christians. W. --- Forsaken me in the agony. C. --- Christ had all the sins of mankind laid upon him. Bert. --- He did not suffer to release those who were already damned; though they had received sufficient graces, in consequence of the merits of his future death. H. --- Christ knew the number and enormity of sin. M. --- But he would not disclose his knowledge. H. Mar. vi. 5. M.
Ver. 14. Be pleased. The rest is nearly transcribed. Ps. lxix. C. --- The Church prays for her weak members. W.
Ver. 15. Backward, as those who came to seize Christ were twice. Jo. xviii. 6. --- He prays for their conversion. S. --- Shame might have proved very salutary to them. Theod. --- The reprobate will be confounded. W.
Ver. 16. 'Tis well. The Hebrew here is an interjection of insult and derision, like the Vah. Matt. xxvii. 40. Ch. --- As S. Jerom here expresses it, Vah, Vah. See Mark xv. 29. M. --- The Jews have now become objects of contempt, (C.) a just punishment (H.) of scoffers, who wish evil to the good. Ver. 17. Magnified. Thus may those speak, who sincerely love God. W.
Ver. 18. Beggar. King David might assume this title, as well as all mankind. S. Aug. --- The same may be applied to Christ, according to his human nature, as the end of this psalm, and the following, belong to him, more than to David. C. --- He speaks in the name of penitents, whose sins he had undertaken to wash away. W. --- Careful. Heb. "will think of me." H. --- Slack. The faithful prayed for the coming of our Saviour, as they still entreat him to hasten the reward of the good. W.